I am sure some of you may have heard about Jurlique, an Australian organic skincare brand. Jurlique is available here in Malaysia and at SkincareRx too. Jurlique takes pride in their products because accordingly they grow the herbs and flowers and harvest them by hand. The ingredients are obtained from their own certified organic and biodynamic farms. 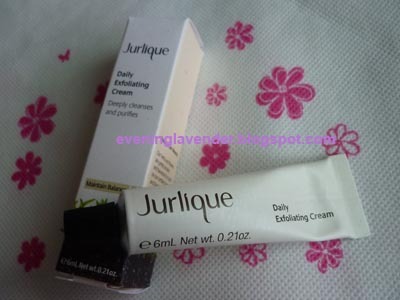 Jurlique Daily Exfoliating Cream is a daily non-granular exfoliating cream, rich in oats, almonds and honey to loosen and lift away dead skin cells. It promised to leave the skin deeply cleansed, smooth and radiant. 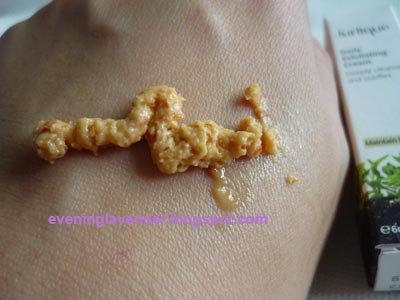 Apply a generous amount to wet hands and form a smooth paste. apply paste to the face in a press-release motion, avoiding eye area. rinse well with warm water. Can u see the oat flakes and almond flakes? I would recommend this product to people with dry or sensitive skin. Normal skin will benefit too. Have you tried any Jurlique products before? Any blogger friends from Australia can perhaps share your view here.